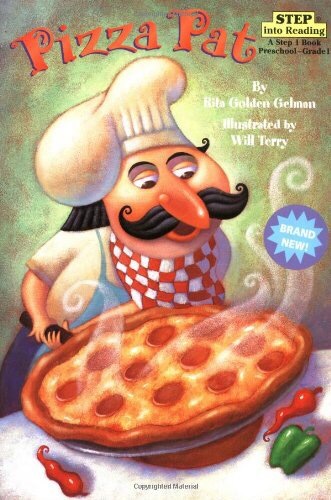 When my kids were little, there was a story book they loved, called Pizza Pat. It was one of those audibly appealing books where the story rolled off the tongue – “this is Pat…This is the tray that Pat bought…This is the dough all stretchy and floppy that lay in the tray that Pat bought…this is the sauce all gooey and gloopy, that covered the dough all stretchy and floppy, that lay in the tray that Pat bought…”. And the story built up to the desperate finale where these mice steal the finished pizza as an exhausted Pat sleeps. It was a wonderfully rhythmic story that was a favourite at bedtime and probably did a lot to build up their reading and sequencing skills and established our love of pizza! Growing up in Singapore our initial exposure to pizza was of a mass produced version a la Pizza Hut. As more players entered the food scene, thin crust wood-fired Italian pizza started to appear. I had a friend who actually was a distributor of pizza ovens and she actually gave me one and this resulted in many many fun pizza parties. It is a universal crowd pleaser to be able to stretch out your own dough and to choose your own toppings. The only problem is that the pizza oven needed to be frequently used, if not the heating coil would short out. Which is why we ended up having to do pizza parties pretty frequently! When I went low carb however, one of the things I really missed after a while was pizza. In the early days I was desperate enough to order frozen pizza crust from Netrition, but somehow these all tasted like chewy cardboard. Then I tried to make cauliflower pizza, which was decent but somehow didn’t hold that well together, and seemed pretty tedious to have to process the cauliflower and squeeze out all the liquid. Then one day I read about chicken crust pizza. 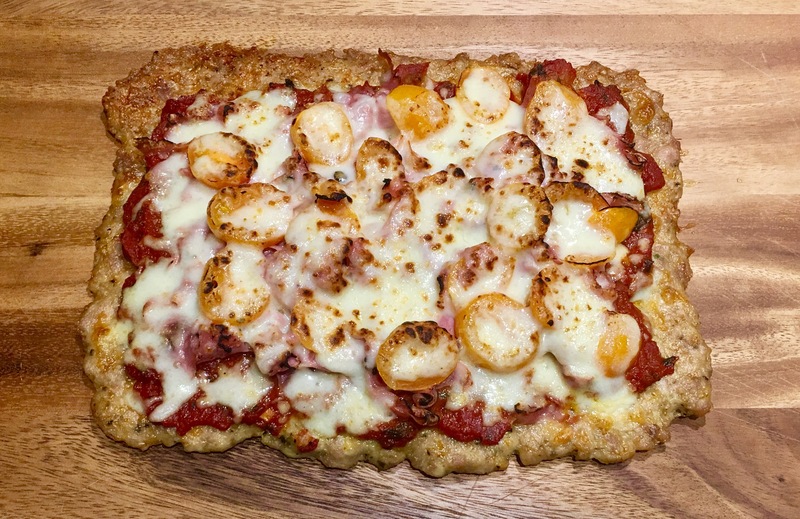 Whoever first thought this up must have been a genius because the crust is easy and flavourful, and while you don’t have the typical chewiness of a flour dough (like Pizza Pat’s stretchy and floppy version), this meat pizza feels hearty and satisfying. For this recipe because the crust is already meat based, the topping had more sliced tomatoes to lighten up the stodginess of the meat. Peppers would work as well although I hardly use peppers as it is one vegetable that I don’t really like. What I also like about this recipe is that the cheese acts as a binder and no egg is used, unlike cauliflower base pizzas. Somehow I prefer the taste of meat to egg in pizza! When the chicken crust is done, place a generous amount of pizza sauce on top of the crust, followed by the ham, cherry tomatoes and finally a good handful of mozzarella cheese. Put the oven into overhead grill mode. Put the pizza into the oven. Grill for 10 minutes. Remove and serve hot. Instead of squeezing the grated cauliflower by hand, when I grate cauliflower I buy a lot, grate them with food processor, then bake them at 100C for 1 to 2 hours to dry them up. Then I store in fridge or freeze. The dried cauliflower is very nice to use to fry as fried rice.